The country is planning to overhaul the university system to attract larger numbers of foreign applicants, reports Zhao Xinying. 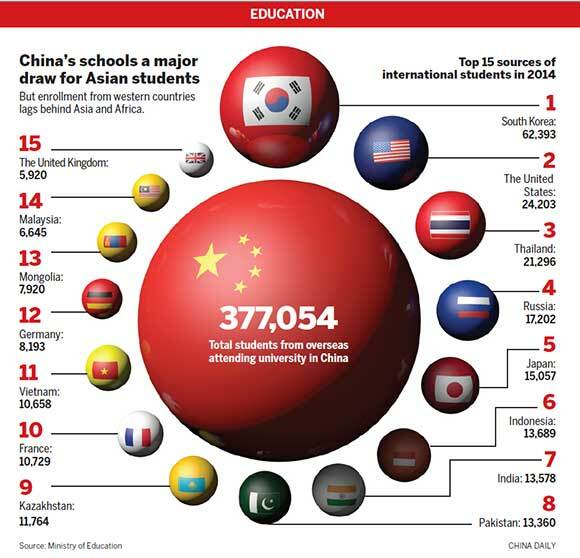 In 2014, more than 377,000 students from 203 countries studied in China, according to the Ministry of Education. The Institute of International Education calculated the number of foreign students as 356,499, and ranked the country as the third-largest host of international students after the United States and the United Kingdom. Whatever the true number, in the eyes of Fang Jun, deputy director of the Ministry of Education's Department of International Cooperation and Exchange, the statistics don't tell the whole picture. Although the numbers proclaim China as the world's third most-popular location for students from overseas, factors such as the middling quality of the education provided and the sources and structure of the international student group need urgent review and updating, he said. Judging by the numbers alone, China has made great progress in the provision of education for international students in the past four decades. In 1978, about 1,900 international students studied in China, but by 2014 that number had risen more than 200 times. Currently, about 2,500 universities offer places to international students, while in 1990 only about 100 universities were allowed to recruit students from overseas. Fang said the sector is unbalanced because most international students study arts-based subjects, especially Chinese language, and those studying sciences, engineering and business account for a small proportion of the total. Another imbalance is the low number of students studying at degree level or higher. Only 44 percent of international students come to China to study for a degree. The others are on short-term study programs, many as exchange students who stay for a semester or two before returning to their countries to study for a degree. The situation is the reverse of those in the US and UK, where degree students account for the majority of the international group. 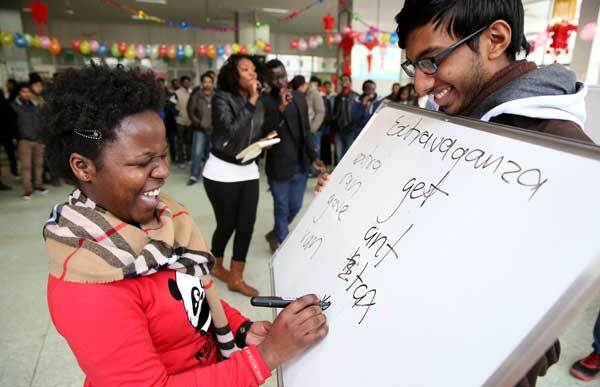 In addition, rather than coming from a wide range of countries, most of the overseas students pursuing degrees in China are from concentrated regions, with more than 70 percent hailing from neighboring countries in Asia or from the African continent. "Efforts need to be made to diversify the sources and types of international students coming to study in China," Fang said. Chen Zhiwen, editor-in-chief of EOL, China's largest online education portal, said it is understandable that a large number of China's international students come from countries in Asia and Africa. "Looking at the picture across the world, international students have two general directions of mobility — traveling within their own continent, or traveling from underdeveloped and developing countries to developed countries," he said. According to Fang, affordability is one of the factors that international students find most attractive about studying in China. He has noticed that medical students account for more than one-fifth of the long-term academic body, and many of them are from Myanmar, Laos, India and Sri Lanka. "Those countries are unable to nurture their own medical talent, which means their students have to travel overseas if they want to study medicine," he said. "It's much easier, cheaper and more convenient to study medicine in China compared with Western countries." The charging standards released by the Ministry of Education show that an international student studying at undergraduate level pays an annual tuition fee of 14,000 yuan to 26,000 yuan ($2,100 to $3,600). In the UK, the cost of undergraduate study varies greatly between public and private universities, but most students pay around 10,000 pounds ($14,500) a year. "At present, China mainly relies on its cultural, cost-performance and geographic advantages to attract international students," Fang said. "In the future, the focus should be shifted to improving the quality of education and forging a good reputation to attract more brilliant international students from different countries." The Ministry of Education has set a target of 500,000 international students in China in 2020, but a number of obstacles will have to be overcome before that goal is realized, according to Fang. He said the lack of courses taught in English is a key challenge because many prospective students are dissuaded by the language barrier. In Fang's experience, English-speaking countries such as the US, the UK and Australia have unparall-eled advantages when it comes to attracting overseas students, and those advantages have provided those countries with large amounts of foreign exchange. Data from the Australian Bureau of Statistics show that from April 2014 to March last year, international students contributed a record A$17.5 billion ($12 billion) to the national economy, a year-on-year rise of 14 percent. The 2015 Open Doors Report, published by the Institute of International Education, found that the 975,000 international students at colleges and universities in the US contributed $30.5 billion, and supported more than 373,000 jobs during the 2014-15 academic year. In comparison, some non-English-speaking countries — despite being highly developed and offering good-quality education — either have to invest vast sums to provide free education or offer large scholarships to lure students from overseas, Fang said. China is a non-Anglophonic country, and Mandarin has a global reputation as a tough language to master, so the dearth of courses taught in English and the sometimes indifferent teaching can play decisive roles when international students are deciding where to study, he added. Katerina Galajdova, from the Czech Republic, studied Chinese in Beijing during the 2014-15 academic year. She said Czech students are reluctant to study in China because the language barrier seems insurmountable. "Here (the Czech Republic) people don't really study Chinese, only a few people do. People learn English as their first foreign language, and Chinese is a very ‘exotic' language for us," she said during an exchange on WeChat, an instant messaging platform in China. Galajdova believes Chinese universities should provide a more-diverse range of courses in English to make them more attractive to overseas students. "More qualified English programs and teachers would help. Programs about international trade, business, and other related topics," she said. A survey by the University and College Admissions System, a company that provides services to overseas students hoping to attend a Chinese college or university, showed that the difficulty of learning Chinese is driving the need for courses taught in English. However, by 2014, just 15 percent of Chinese universities that recruit international students were providing courses in English, according to the survey. Zheng Tianying, the company's CEO, said the growing number of courses taught in English, particularly at undergraduate level, is becoming an irresistible trend for China's universities. 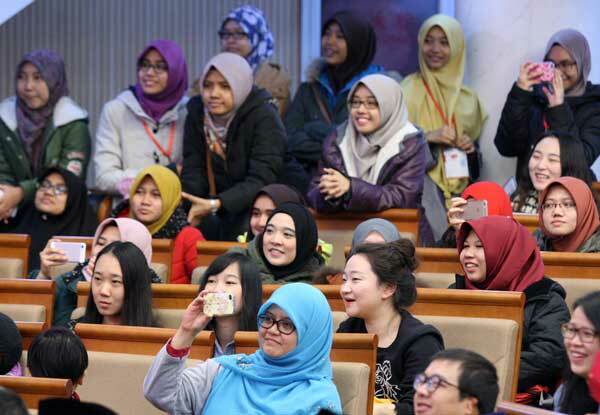 Despite that, the reality is that most Chinese universities are lagging far behind the trend, which limits the number of international students prepared to study in the country, he said. According to Wang Huiyao, president and founder of the Center for China and Globalization, a think tank in Beijing, the language barrier and poor teaching are not the only problems facing prospective international students in China. Many are also dissuaded by the difficulties of transferring academics credits between countries and also by the obstacles they face to verify their qualifications outside China. "If your home country doesn't recognize the credits or academic degrees you obtained in China, then in most cases, you wouldn't be willing to come to study in China, right?" Wang said. By late last year, 43 countries had signed agreements with China to simplify academic credit transfers and provide mutual verification of qualifications. "China should communicate and cooperate more frequently with educational institutes in other countries, to make credit transfers and verification of qualifications easier and smoother," Wang said. "That would definitely help China to attract more students from a larger number of countries." Fang said the Education Ministry is aware of the problem and that a platform is being built to enable mutual recognition and easy transferability of credits awarded to international students in both China and their home countries. "It's not an easy task, but we've made some breakthroughs," he said, citing the ministry's recent cooperation with U15 — an association of 15 research universities in Canada, including the universities of Alberta, Toronto and Waterloo — as an example. 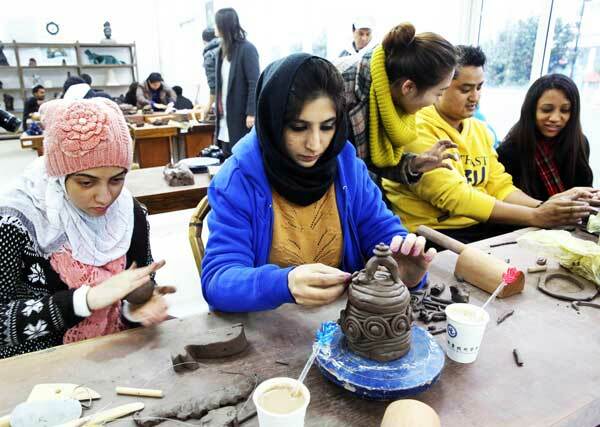 Thanks to the enhanced cooperation, some prestigious Chinese universities selected by the ministry will offer a series of high-quality courses to attract U15 students to study in China for four to eight semesters. The credits achieved will be recognized by both countries.